Do underground oceans vent through the tiger stripes on Saturn’s moon Enceladus? Long features dubbed tiger stripes are known to be spewing ice from the moon’s icy interior into space, creating a cloud of fine ice particles over the moon’s South Pole and creating Saturn‘s mysterious E-ring. Evidence for this has come from the robot Cassini spacecraft that orbited Saturn from 2004 to 2017. 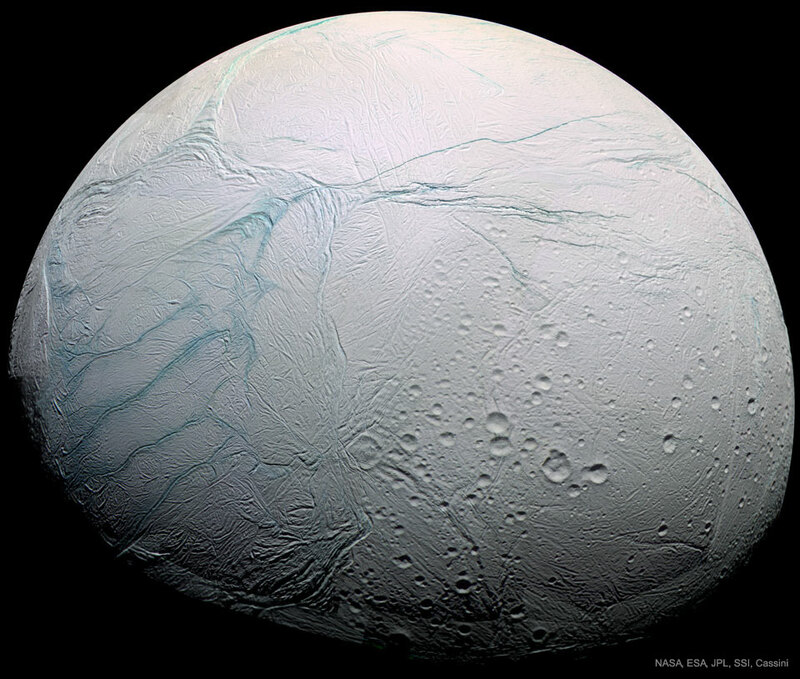 Pictured here, a high resolution image of Enceladus is shown from a close flyby. The unusual surface features dubbed tiger stripes are visible in false-color blue. Why Enceladus is active remains a mystery, as the neighboring moon Mimas,approximately the same size, appears quite dead. A recent analysis of ejected ice grains has yielded evidence that complex organic molecules exist inside Enceladus. These large carbon-rich molecules bolster — but do not prove — that oceans under Enceladus’ surface could contain life. Posted on Sunday, 1 July 2018 by VGC	This entry was posted in ifttt-photograph and tagged IFTTT, NASA. Bookmark the permalink.